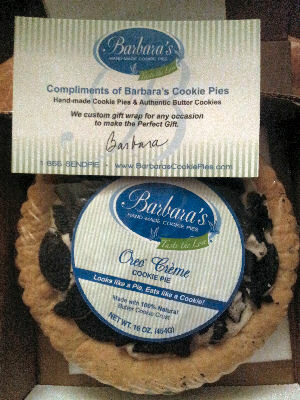 I was recently asked if I would like to do a review for Barbaras Cookie Pies. Now being that our weather is changing and I have a strong sweet tooth around the holidays, I said “OF COURSE”. 🙂 I received a Barbara’s Cookie Pies Oreo Cream Cookie Pie ($19.50). Let me just tell you, my husband was happy! His favorite cookie is Oreo, I’m not big of them. Barbaras Cookie Pies are the evolution of the cookie into something bigger and better… a decadent fusion of traditional cookie & candy classics with a modern artisan touch. They look like a pie, but eat like a cookie! Cookie Pies start with 3 generation family butter cookie dough recipe. The buttery cookie dough (a treat by itself) forms the bottom layer of each Cookie Pie; then filled with popular cookie & candy toppings. It’s a cookie-in–a-cookie! Barbara’s Cookie Pies only uses high quality ingredients and make each pie scratch. Pies are made in small batches, hand-pressed and hand-decorated. OREO® which reigns supreme as the best-selling cookie in the world. The OREO ® tradition is carried forward with our Cookie Pie version. Appetizing sweet white crème sits atop a home-made butter cookie crust and is then garnished with genuine OREO® pieces for an irresistible classic treat. When we received the pie it was a very warm day and the delivery guy did not ring our bell, so outside the pie sat. 🙁 After finding the cookie pie on our table on the porch, we put it in the fridge. The cookie pie wasn’t melted, but it was a little warm from being outside. Now this was just 2 weeks ago! I was not too happy with the delivery guy either! After we ate dinner that night, hubs took the pie out the fridge to cut it. It was a bit hard to cut slices with a knife. It was also hard for a fork (I tried to cut it like a normal pie, not thinking it was hard!). Hard or not, it tasted awesome! Just like an Oreo, sweet and oh so tasty! I LOVED that crust! The next day, we took the pie out the fridge before dinner, when we were ready for dessert, hubs cut the pie without a problem. So lesson learned. With the last piece of pie, my husband popped it in the microwave (it was in the fridge). He said that was the best way to do it, it was soft and easy to cut with a fork! Just as tasty too! If you’ve never tried Barbaras Cookie Pies, I urge you to do so. Their cookie pies and cookies are great for gifts, parties, desserts, holidays, snacks & catering. Barbaras Cookie Pies also offers Fundraisers, Corporate gifts, Chocolate Dipped Dried Fruit and more! Barbara’s Cookie Pies and Butter Cookies are delivered fresh to your door locally and nationwide. Disclaimer: I would like to thank Barbaras Cookie Pies for the Oreo Cookie Pie ($19.50 Value) in exchange for an honest review. Our reviews and giveaways are in no way affiliated with Facebook or Twitter. No compensation was exchanged. I was not required to write a positive review. Our opinion of this product is entirely our own. We are disclosing this in accordance with the Federal Trade Commission’s 16 CFR, Part 255: “Guides Concerning the Use of Endorsements and Testimonials in Advertising.” To read the full disclosure, click here. That looks so delish!!!! I’ll have to check them out!